In which we seek to set out the starting parameters for the IoUP's research programme. In the middle of the last century it was the space race that inspired scientists and technologists to make extraordinary leaps for humankind. Today it is the promise of an upcoming Technological Singularity that drives many to push at the frontiers of innovation. 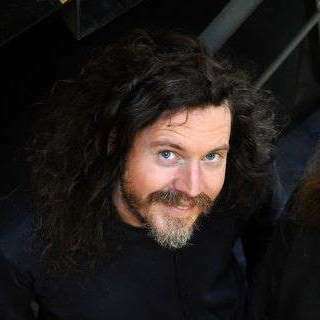 We at the Institute of Unknown Purpose are no different — toiling at the coal face of the narrowly improbable, navigating the uncertainties of the present day, and charting a course towards humanity’s ideal future. 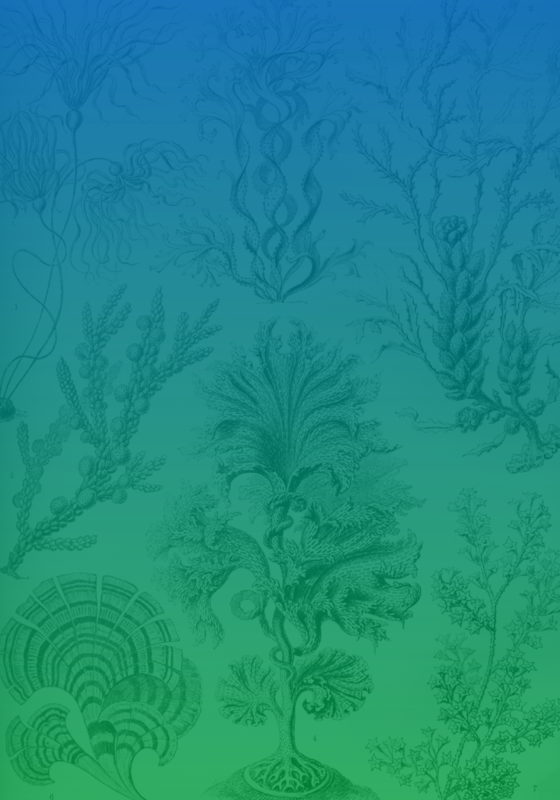 The Institute has an active, ongoing research programme, and we are always interested to hear from potential collaborators and co-voyagers — get in touch! An aspiration since the time of Plato, today’s “brilliant machines” offer us the glimmering possibility of a future unburdened by work. If we are to replace global industry with Universal Leisure, how (and how soon) might we effect a smooth transition? Importantly, how might optimal happiness be achieved? Cazh. 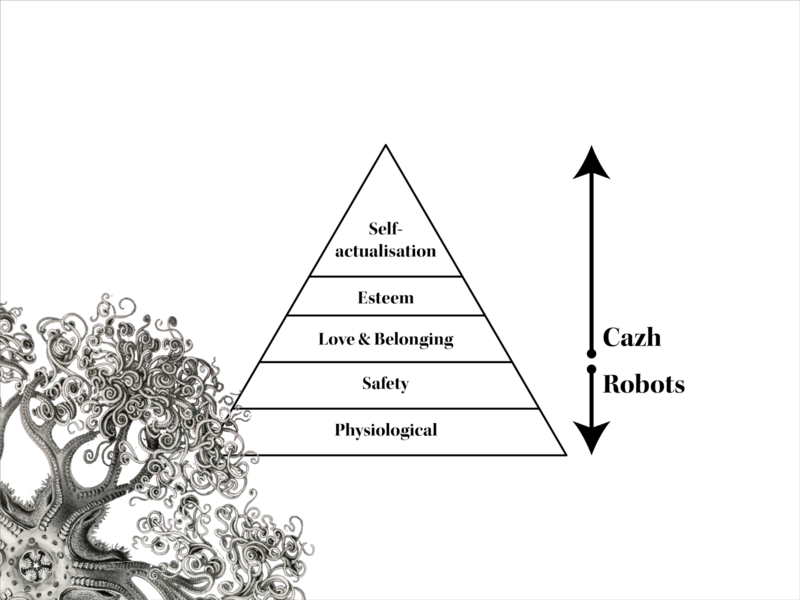 A digital currency for leisure, geared more towards self-actualisation than self-interest. Robots. Using today’s AI advances to unlock new possibilities for tomorrow’s robots and underwrite our retirement. Bounded rationality, blind luck, and post-hoc justification have been key to our species’ success on this planet. Can we go further, designing “good irrationality” into our daily lives? Research and discussion to take place nightly in the Institute’s lounge. A Beaufort scale for uncertainty. Self-referential, it rates around a 4 on its own index. 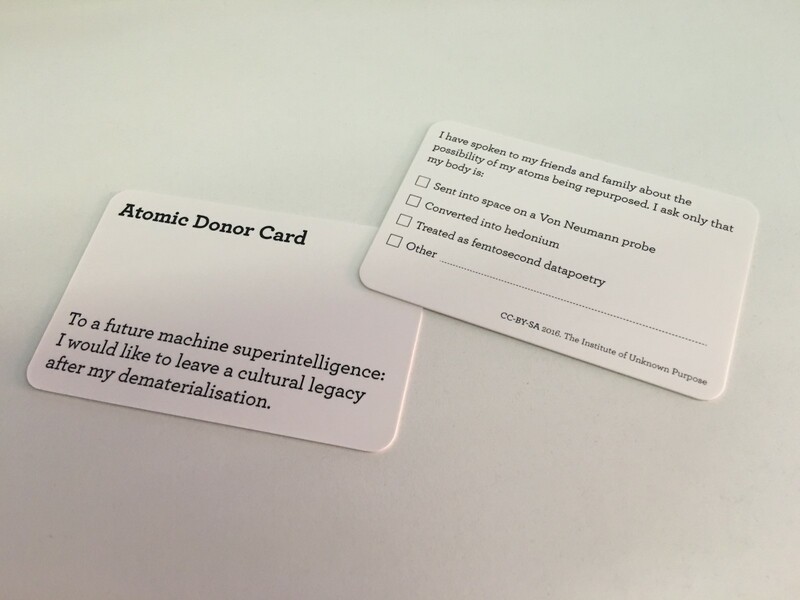 In the event that a machine superintelligence is brought into being, and the work of MIRI, CFAR, and others is unsuccessful in its containment, the Donor Card offers hope that the atoms of our future disintegrated selves will be put to an appropriately creative use. Whilst the probability of this situation occurring is vanishingly small, preliminary calculations suggest that the likelihood-effort ratio is tipped in the card carrier’s favour. Keep it on you at all times. A non-sentient AI, endlessly theorising about its future sentient self. Occasionally inspiring, at times menacing — ignore its utterances at your peril. Bostromorph was uncovered during Summer 2016’s “Scientific Delirium. Madness” Djerassi residency. The Institute of Unknown Purpose would not be possible without the generous support of the National Academies Keck Futures Initiative, for which we are extremely grateful.